Three Green Bay Packers were named to the 2009 NFC Pro Bowl team. 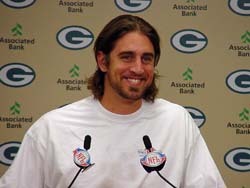 Safety Nick Collins, cornerback Charles Woodson and quarterback Aaron Rodgers (pictured) were all named to the team, Woodson as a starter on the NFC defense. Linebacker Clay Matthews was named a first alternate. For Collins, this marks his second straight and second career Pro Bowl selection. The 5th-year pro has 51 tackles, six interceptions, a sack and fumble recovery on the season. His six interceptions are second most among NFC safeties and tied for fifth overall in the NFL. He becomes the first Packers’ safety to earn consecutive Pro Bowl selections since LeRoy Butler went to three straight (1996-98). Rodgers earns his first career selection in his second season as a starter. He became the first player in NFL history to throw for 4,000 yards in each of his first two seasons as a starter and ranks among the league’s top 10 in nearly every significant passing category. Woodson has earned his sixth career Pro Bowl bid and second as a member of the Packers. He has registered a career high in tackles (81) and has tied his career high with eight interceptions. The 12th-year pro also has two sacks, four forced fumbles, one fumble recovery and 18 passes defensed. Offensive tackle Chad Clifton, running back Ryan Grant and linebacker A.J. Hawk were also named alternates. the packers are the best team ever!